and HeI lines showing more or less a single peak). determine emission measure, Te, etc. After a very rainy and covered night yesterday...I was able to resume tracking TCPJ19544251+17222 again. The Balmer, HeI and HeII lines are clearly visible. 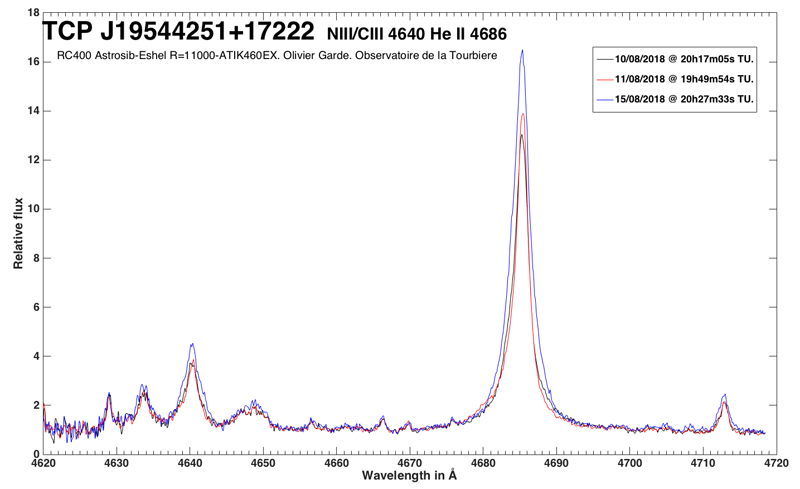 Some FeII lines seem to be present in the two spectra as well the [OI] line at 5577A...but [OIII] lines are not visible. Congratulations on all your results! The 13/08/2018 spectrum, Lhires III 600 l/mm. A slight better resolution (better thermal stabilization of the spectrograph) were reached respect to my last observation. No apparent evolution compared to 11/8 spectrum. Thank you very much Paolo ! Congratulations also for your very first spectrum and...the mention of the shorter name of TCPJ19544251+17222 aka Vend47 !! 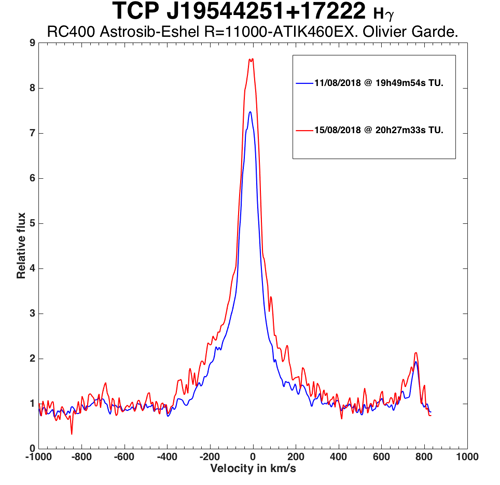 Nevertheless, it appears (maybe…) to be a slight increase in the relative intensity of the HeII line at 4686A. I just noticed an evolution on order #48 : NIII CIII HeII 4640 and especially on the Helium II 4640 which tends to widen. Un temps d'observation très long, mais ca vaut le coup (1200 s en pose élémentaire... quelle est la température de ta caméra ?) ! Christian Buil wrote: Un temps d'observation très long, mais ca vaut le coup (1200 s en pose élémentaire... quelle est la température de ta caméra ?) ! Chez moi, sur une Atk460EX à -10°, j'ai l'impression que je dois avoir pas mal de points chauds, dont certains saturent (je n'ai jamais pratiqué un temps de pose aussi long avec cette caméra). C'est ton cas ? My result for Aug 17. 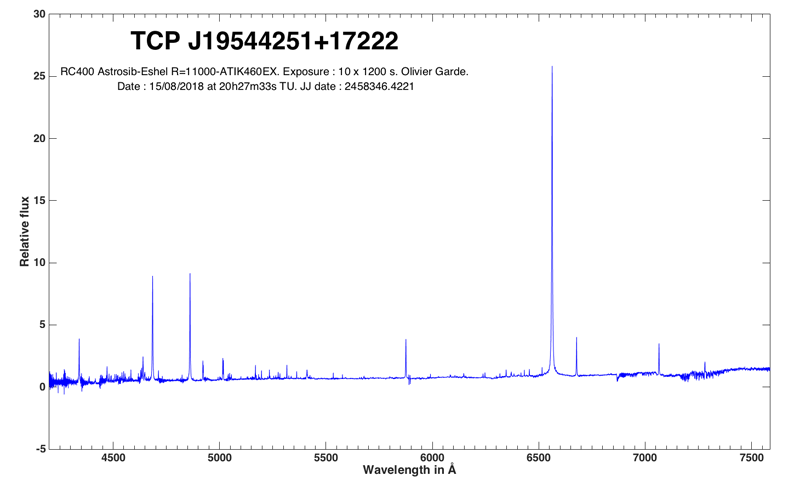 A difficult target for Echelle spectroscopy and conditions were not ideal - very high humidity and haze.